I just wanted to offer some seasonal reflections, looking back on 2013, and suggest a fine present for last minute shoppers! Surrey Youth Focus has had a very good year so far. The staff team is the strongest and most professional ever, and I greatly enjoy working with ( for? ) them all : Kate Peters (Funding and Finance; Su Freeman(Marketing and events), Karen Moore(Website and social media) , and Tasha Parkin (Workforce development and HR advice). We do work well together and it does make working enjoyable. Our membership has been sustained and we are launching a big marketing campaign early in the New Year aimed at some 300 potential new organisations. We are also holding discussions in West Sussex (with the County Council and former members of WSCVYS) about whether they would value a "West Sussex Youth Focus" or similar. I met this week with Surrey CC's property person to discuss terms and conditions for us to take over the property management of Woking Youth Arts Centre (5 year lease), which we would do through a social enterprise with separate governance/finances from SYF but all subject to the agreement of our Trustees on 4 Feb. The advertisement for a CommUniLAB project manager is published on our website, and again we'll have a big marketing push in the New Year. I've had a couple of meetings this week about the re-commissioning of mental health services (£9 mill pa for each of 3 years) - tenders due out next August, and the probability is that a lead agent model will be sought. I had a useful meeting with the Director of Public Health about the links between her agenda(obesity, mental health , teenage pregnancy etc) and that of youth workers in the voluntary sector who address the same issues. Intensely busy, like everyone else I meet at present. Good meeting on Monday with Deputy Police and Crime Commissioner about cybercrime - a classic Surrey crime (like domestic violence, and excessive alcohol consumption). We have agreed to promote a train the trainer programme about it, and with particular reference in our case to cyber-bullying. The Surrey Charity CEOs are up in arms about a Surrey CC report from Adult Social Care that proposes moving both commissioning and providing into a Local Authority Trading Company, thereby preserving an internal service whilst appearing "innovative". West Sussex CC are doing something similar by "outsourcing" to staff mutuals. Nobody minds about competition but this has the appearance of protectionism. Why now you ask? Well Nick Hurd sent an important letter to local authority Leaders (25 April 2013) in which he encourages them to do this. Just come back from a National Consortium of Social Enterprises workshop at which NOMS, SERCO and others were explaining the opportunities for social enterprises, but always at the bottom of the food chain (tier 3 - ie sub-subcontractor). I was presenting on Consortia and social enterprise. More strategically I am concerned (hence the grumpy) that the boundaries between private .public and voluntary sector are fast becoming yet more confused and blurred. There are two potential problems: first a descent into the sort of lack of accountability for service delivery that in other places we call corruption in failed states, and second a lack of transparency and electoral accountability of government (whether central or local). Met on Wednesday with a very positive person from Crawley CVS and "Young Crawley" from whom we have much to learn - they have a Lead agency a consortium of 17 service providers working with young people. Some providers are very small volunteer only neighbourhood charities. Impressive. Good meeting with my new Chairman Designate about succession planning for my post and we have the process(only) organised. Met too at the Woking Youth Arts Centre to check over the interior layout and marketing potential, and am meeting this afternoon with our charity lawyer to set up the SYF property management company to run it. Woking BC are advising on its market potential for bookings by local users. The Boss has told me Christmas is coming, and that I need to get going on shopping..so I'm taking Friday off on leave. So that just makes me more Grumpy!Bah Humbug! AS regular readers know we are constantly trying to improve what we do, so this week we have been looking at how to extend our reach out to the voluntary youth sector at large, not just to our own members. To this end we've been making or commissioning some improvements to our website to make it more accessible and interesting. We've also been sharpening up our Member offer, and will be having a big marketing campaign in the New Year. We've advertised our CommUniLAB project manager post (see website) and concluded the contract with our first young Apprentice for Surrey Youth Enterprise. We have been in discussion with Surrey CC about improving their processes for the administration of the County small grants scheme, which is now pretty much spent out of its £220,000. We are hopeful that it will be run by us again next year. I went to a joint meeting of the Youth Justice Board and the 14-19 Partnership on Thursday to hear about the "Public Service Transformation" work being done between Surrey CC and Government. The short version is that SCC and partners are negotiating for a transfer of Government funding to local government IF SCC can demonstrate how it can save the Government money by getting more young people(eg NEETs and those on JSA into employment. There was also a very telling presentation by one of SCCs Area Managers in the Youth Support Service about Safeguarding issues- making the point that safeguarding is not only about very young children , but that in law a child is up to age18. I was at the Active Surrey annual conference yesterday afternoon(I have been on the interim board of the Surrey Sports Strategy). Good presentations on how to motivate people to undertake sport/exercise..NOT by telling them about the long term risk of heart disease/obesity, but by emphasising the short-term benefits -fun with friends,glowing skin, challenging self, and securing emotional buy in. Also an excellent talk on why we should all use social media for marketing, and especially to recruit volunteers. For friends in West Sussex - a very useful report -"Sussex Uncovered" - was featured on our West Sussex e-bulletin and much referred to - published by the Sussex Community Foundation. Huge difference in average household income - Surrey £39,000 and Sussex £27,000. Carols, mulled wine and mince pies this evening! Very festive! This has been a really interesting and enjoyable week in which I have had several very important briefing meetings which will inform my writing the next "Young Surrey : Strategic review 2014/15" in February. 1) The Cabinet Office under Nick Hurd has a team of people working on youth policies/priorities which are: young people’s Voice, Employability /skills, Youth social action (DoE, citizenship, volunteering and National Citizen Service) and local (youth ) provision. 2) Surrey CC is reviewing the entirety of its Youth Service starting now, so that it can make “significant cuts” in 2015/16 onwards, whilst it seems that SCC funding for next year is reasonably secure. This review will affect ALL SCC youth work - grants, commissioned contracts, and internal delivery. 4) Great emphasis is being put nationally on the value of youth umbrella /membership organisations in counties and boroughs where they exist STRONGLY, because of the leadership /representation role so that for central and local government the XYZ organisation (like Surrey Youth Focus) is valued as the obvious go to organisation. 6) Just appointed our first young Apprentice to the Surrey Youth Enterprise CiC this week , being our social enterprise in Leatherhead. The week has ended on a frustrating note as our otherwise excellent Cloud computing system crashed this morning because of a systems failure on the part of their chosen host server that was under cyber-attack. The net result was that I lost 3 hours of work this morning unable to get on to the computer. Of course this merely serves to demonstrate how fragile our information infrastructure is.....must write that disaster movie script! Information has been a key to this week. We sent out the highly regarded Surrey Youth News, including to our friends in West Sussex in case they want a West Sussex insert in the next (March) one. Similarly we have also sent out our first West Sussex e- bulletin too. I am meeting the Interim Head of West Sussex 's Youth Services on Monday. I've written an important discussion paper for The Youth Consortium about the future of youth centre buildings/ centre based youth work for discussion with Surrey CC. The issues under discussion is the future of that contact. I am suggesting a NEW(ish) approach based on a mixed economy of community hubs (whether SCC or TYC) giving a "single doorway" access to a mixed economy of SCC/TYC services, depending on whichever is the most cost-effective provider. Importantly youth workers need to be the brokers/enablers to integrated services designed around the young person. Interesting models in LB Newham, Slough BC, and in Bucks. where youth centre buildings have been transferred to the voluntary sector. Met today with colleagues from LB Newham voluntary sector to have a very interesting exchange of ideas/papers in this field. I'm also now moving the CommUniLAB project forward by getting ready to advertise the project worker- this is the information hub/exchange project funded by Barclays. Delighted that our new Workforce development and HR adviser has stated with us - Natasha Parkin, who is a fully qualified CIPD person. Her role is to develop our services in relation to three workforces: adult volunteers( setting up youth clubs,volunteering,links to businesses/corporates) young people (DoE, volunteering,apprentices, National Citizenship Service,) and youth workers (qualifications, CPD and arranging workshops). She will also be producing standardised templates on HR matters which member organisations can draw upon.The consequence of having a team of five now is that we've re-arranged the office, and bought new desks that wehad to assemble them ourselves - well, Kate and Su did! (Kate actually reads instruction booklets!). We are also now working on our first e-bulletin to West Sussex voluntary youth sector, but taking it slowly because we want to get it right- we have inputs from SPARK(East Sussex cvys) and East Grinstead CVS amongst others. I have opened up a line of communication to West Sussex CC about West Sussex issues - we have received legacy funding to undertake this leadership role - and I am keen to meet up with WSCC senior managers about the implications of the SEND agenda for example. Very useful briefing on Tuesday by the CEO of our national body NCVYS who came down to see me about various matters. The Cabinet Office is apparently reviewing relations between the statutory and voluntary youth sectors and some London Boroughs are forming mutuals/partnerships between the local authority/voluntary/business sectors to address the needs of young people. Interesting hybrid model. I have begun developing our links into West Sussex under the legacy programme agreed with our sister organisation WSCVYS which has now closed. I've established a link with West Sussex CC's CEO (who I know from old) and will talking to his colleagues shortly, and then following up with local focus groups in West Sussex. Our first West Sussex e-bulletin should go out next week. Met on Thursday with the CEO of East Surrey FE College in Redhill - a superb university style campus, and great learning environment for its students. The meeting was about running workshops for young people aged 16-24 about How To set up in self-employment/social enterprise.Great interest. We're running one of these workshops in Woking on 3 Dec. Contact me for details. Our "Surrey Youth Enterprise CiC" is currently recruiting 2 level 3 Apprentices in Customer Services (See NAS website for details). Surrey Youth News is about to go out next week, and I have to do some work on West Sussex, CommUniLAB, and the Consortium. Meanwhile tomorrow (Sat) we have a Staff/Trustees awayday to work on our general strategy for 2014-17, starting with a video from Surrey CC's Assistant Director about what he'd like to see us doing - SCC being a key funder and stakeholder. Lunch in London on Sunday. So even the week-end is all go!Mike"
Well for some it has been half-term, but for the rest of us it began with a stormy Monday morning and a meeting at County Hall with the Chief Executive of Surrey CC and some of his senior mangers with charity sector chief executives. All the charity chief execs scheduled to attend did so, despite the weather, and to our collective delight it was a very positive and productive meeting about how we might all work better together. The advertisement to recruit two young apprentices for the social enterprise have been posted on the National Apprenticeship Service website today, and we hope to have appointed them by the time of our launch to invited guests before Christmas. I have sent out the agenda and papers for our important staff/trustees awayday on Saturday 9 November when we'll be considering our longer term direction of travel from 2014-17; we always operate with a three year strategy and an annual business plan. We have all been hurrying along to fill in any gaps in procedures/practices in readiness for our Pqasso Level 2 submission (funded by Henry Smiths) and if we;re successful we'll be joining an elite group of just 70 charities with this quality mark. (We already have level 1). As..OK ..Assistant England Coach, and going to Twickenham on Saturday with at least one of my sons, I am rather doubtful of England's preparations as the Aussie are battle hardened against NX, S. Africa and Argentina, and we have several new pairings. Hence the doubts...but a couple of beers and a steak pie will help. Have fun - I will! Last Saturday we held our excellent Celebration of Youth performance event by young people and exhibitions. 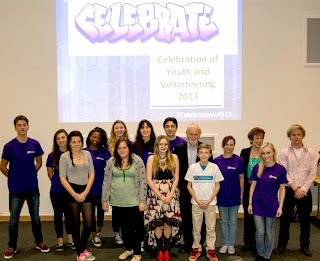 You can read the story on our website http://www.surreyyouthfocus.org.uk/news/celebration-of-youth-2013 and in local newspapers like Surrey Times. This was followed by a Trustees Board meeting on Tuesday evening at which we agreed to take up the offer from Surrey CC to undertake the property management of the Woking Youth Arts Centre; we have a number of requirements if this project is to go forward from next April, but I daresay these can be met by Surrey CC. Trustees also confirmed our offer out to former West Sussex CVYS members to join Surrey Youth Focus, and this offer is beginning to be taken up. The social enterprise now has its first employee – a disabled young person who has been retained to do financial admin. She has been a volunteer elsewhere and illustrates how volunteering can lead to jobs. We are beginning the search for at least 3 young apprentices right now in customer care/sales. We have some £100,000 orders in prospect. So something else to celebrate. Brilliant week! Monday saw an interesting discussion led by SCC’s consultants, both of whom I know, who are preparing the vol. sector to bid for the £9mill pa mental health support to children and young people to be tendered next year as a county wide contract. The challenge to us in the fragmented charity sector is to collaborate together to bid. Very interesting to compare/contrast with the way in which the same Directorate in SCC put out the local prevention framework to (grant) bids. The difference is the involvement of the health sector in the mental health spec. and having been gung ho about “World Class Commissioning” they have now realised the perils. Meeting of the Charity Chief Execs this (Friday ) afternoon to prepare for meeting with SCC ‘s top management on 28 Oct on the same range of issues. Great meeting with Guildford FE College about : our self- employment workshops/recruiting apprentices for the social enterprise/ CommUniLAB. Top form meeting of my inner cabinet of Trustees addressing big strategic issues for us: our offer into West Sussex, and the possibility of taking over the management of the Woking Youth Arts Centre- 4 hour meeting, but really careful and positive discussion led superbly by my Chairman, David Hypher. Interviewed on Wednesday to appoint a Workforce Development and HR Adviser – really enjoyable interviews, and we are spoilt for choice; very fortunate position to be in. TOMORROW – SAT. 19 Oct is the CELEBRATION OF YOUTH performance event at Surrey Uni’s management centre, by young people. Exhibition stands from 11.30 am (magician, pop up café, buskers) the show at 12.30 pm. All free and all welcome. This has been another really interesting, indeed exciting week. It began well with a meeting with Woking Borough Council’s Economic Development Manager about running our workshops for the borough’s young people about How To get into self-employment/set up in business. Very positive discussion and great offer coming up for Woking’s young people – “Start-up Woking”. This was followed by briefly attending the superb Careers Opportunities Fair at Epsom Racecourse prior to joining the Surrey CC 14-19 Workshop in the afternoon about the changes under the Children and Families Bill to provision for those with Special Education Needs and Disabilities (SEND). The concern is that the number of children and young people with autism is increasing rapidly – from 10,000 in 2009 to 11,300 in 2033, and since the cost of care for these young people (up to age 25) is substantial , this is a huge growth pressure against declining budgets. This theme was continued at a workshop in Worthing (West Sussex) at which I was talking to about 15 disability groups about consortia working. Again the move to personalised budgets being held by families of c &yp with disabilities was the key theme. This was my first real exposure to West Sussex Council for Voluntary Youth Services (WSCVYS) members , of whom there are 80 in all – a bit like Surrey Youth Focus, and to whom we are offering free membership with us as WSCVYS is closing this week finally. All this is by prior arrangement so that the legacy of WSCVYS could be preserved, as we have been working closely together for some years, and have a Memorandum of Understanding about collaborative working. SO on Monday we will be writing out to WSCVYS members offering free membership of Surrey Youth Focus (paid for by WSCVYS legacy funding) enabling them to access all our services if they wish, and with me running networking and consortium building workshops for them, and meeting up with West Sussex CC commissioners – also paid fro out of WSCVYS legacy funding. We genuinely do not know how this will be received ..as I have lived in West Sussex for 40 years I know that the two counties are very different…..so we are just tip-toing forward for now, but a Surrey – (West) Sussex link would be very exciting in the long run. Interviewing next week to appoint a Workforce development and HR adviser…one of the big issues in SEND/SE7 /personalisation is about training personal assistants (carers) for families of disabled children and young people. Press launch of CommUniLAB on Monday with Barclays Bank. Then interviewing on Wed to appoint a Workforce development and HR adviser…one of the big issues in SEND/SE7 /personalisation is about training personal assistants(carers) for families of disabled children and young people, and on we go….to Celebration of Youth on Saturday 19 Oct at 12.30 at Surrey Uni. Free. All welcome….and it will be brilliant! Out all day this Saturday at a conference at Sussex Uni. Walk on Sussex Downs on Sunday followed by pub lunch with friends to celebrate a birthday..all go!! First that Surrey Connects (not unlike an LEP) have committed to sponsoring our CommUniLAB project. It is great to have their support and confidence in the project, and in consequence of having this additional funding we are now moving on quickly to commission the website and to recruit a part–time project manager to move it forward. We’re working with Barclays, the main sponsors on the press/publicity launch. VERY exciting project. Surrey Youth Enterprise – the social enterprise that we have been instrumental in setting up - is also committing to join CommUniLAB. Incidentally, the social enterprise will be marketing world-class cctv software, sourced in India and for which we have exclusive UK rights. It is amazing…already installed into every airport in India..and half the price of competitors. We currently have £100,000 of orders for this alone….. We have four other world class products to offer, and the CiC will be launching these at a reception on 4 Dec at the Leatherhead office. Currently recruiting 2 young apprentices and other staff. Surrey (Youth Focus) connects also to our sister organisation in West Sussex, (West Sussex Council for Voluntary Youth Services) and with whom we have had a Memorandum of Understanding about close working. Sadly they have now shut down, but as part of ensuring their legacy they are transferring some funding to us so that we could provide a service to their members in – access to our Member Benefits, e-bulletin, funding bulletin and workshops about future needs/consortium building and soon. This is Surrey connecting into West Sussex and is potentially a very significant development for Surrey Youth Focus. We’ll just have to see if we can help the West Sussex youth organisations in a way that they find helpful..time will tell. Monday saw a reception at the brilliant Skillway (arts and crafts charity working with disadvantaged young people in Godalming) to celebrate the receipt of funding and new machine tools from the International Rotary Club (including from India!). They do utterly brilliant work at Skillway. I was part of a small group that met with the Chief Exec of Surrey CC to plan a workshop between SCC and the charity sector about partnership working. I thought it was an excellent meeting; there is a reality that until/unless the vol sector becomes mainly/wholly independent of government grants/contracts there is bound to be a dependency, and sometimes if handled badly a sense of subservience that hence engenders bitterness towards the hand that feeds. That did NOT happen on this occasion – the word was “symbiosis”, as in “symbiotic relationship” wherein differences in scale count for nought because of the mutuality. The further reality (though not part of the usual way of thinking in Surrey’s civil society ) is that taxpayers pay the salaries of public servants (the clue is in the word “servant”) and so any sense of superiority would be wholly misplaced. I think we in the vol sector should be more confident in the value of what we do, and yet realistic. Closing date today for applications for new Workforce development and HR post in our team – all looking good. We had good news this week that Henry Smiths (grant-making trust) have given us a grant over two years to provide an improved funding advice service to our members. This will comprise: funding workshops in evenings/week-ends to ensure that uniformed organisations can attend; tutoring on making grant bids; and improved advice on the website. We will now have addressed the two core issues for many member organisations: getting funding advice and volunteers, for in regard to volunteers we have “wanted & needed” forms on our website, a memorandum of understanding with Business in the Community about collaborative working, and a strategic connection to Surrey Chambers. It’s as good as it gets! I rather belatedly conducted appraisals/development interviews with my 3 team colleagues..it is just great that we all get on so well, and are described as 'a happy team'. We all spend too long at work for it to be otherwise, but it is not always so in my long experience, but is very gratifying. The Surrey Youth Enterprise is beginning to buzz- we are recruiting 3 apprentices through Guildford College right now. The enterprise sources world class innovative products and will be marketing them into Surrey/UK. The products are: amazing CCTV software that is world-beating; vehicular/personal trackers; software for laying out and designing publications; a process for regenerating industrial batteries in an environmentally friendly way. The “social” part of the enterprise lies in our recruitment and training of disadvantaged young people. CommUniLAB is also beginning to buzz, and we will be setting up the first stage of the website soon. Went to Amberley Castle (Hotel/restaurant) for wedding anniversary Sunday lunch –romantic, but expensive! Grandchildren this Sunday- fish fingers and sausages all the way! Enjoying Kate Mosse’s “Labyrinth”. She comes from Chichester and the novel is set in and around Carcassonne – an area we know quite well. And MU beat Liverpool! I was invited to 10 Downing St some years ago (along with about 130 other people) to a reception held by Tony and Cherie Blair, who were charming – and I did speak with the PM - in recognition of work done to assist Government Departments (in my case about community planning) . SO I have walked up /down the Prime Minister’s stairs……. But the slot at our AGM on Tuesday evening called “Prime Minister’s Stairs” called turned out to be a line dancing style networking opportunity that went down a storm. So too did the election of our new Young Trustees – 3 great people who will be a huge asset to SYF. We also approved the succession planning for a new Chairman from next February, by the election of Lesley Myles MBE DL as our Chairman Designate. WE had an excellent speaker in Jon Boagey (Deputy CEO of the National Youth Agency) who pointed to the scale of cut-backs in statutory youth services, and some other current youth work challenges. After the AGM we are now preparing for the Celebration of Youth performance event, on Sat 19 Oct at 2.00ish at Surrey Uni and had a meeting with a student from Farnham College who will be our brilliant Presenter for the afternoon. By contrast to all this jollity, I was contacted by a very worried mother concerned about her son who had been arrested for using /intent to supply cannabis - we are helping them both by referring them to good contacts. I was at the Consortium Board this morning to hear about the impact of welfare benefit changes on young people and the service the Consortium is developing in partnership with the Surrey Disabled People’s Partnership, and finally today I have just picked up an analysis by Surrey Public Health of suicide rates in Surrey.. I am delighted to say that Barclays Bank are the national sponsor and champions of our CommUniLAB project. This will be a virtual learning network made possible by a website and discussion board … into which participating members from Communities, Universities, Local Authorities and Business can ping issues – adequacy of child care provision for example – which we will accelerate round the network, and then , if they gain traction from the perspective of others, we will hold workshops about that issue, and arrive at actions. The point of CommUniLAB is to bring together the perspectives of different sectors/cultures on an issue, thereby enabling people to meet and share views from sectors with which they would not normally engage. The next step is for us to approach other corporates and possible members of this innovative project. Please contact me directly if you are interested in this. On Tuesday evening I was at the launch of the new SE regional office of Barclays Bank Wealth here in Guildford, and on Thursday evening the launch of “Surrey Uncovered” by the Community Foundation for Surrey hosted by Surrey University . This research report is aimed at demonstrating to possible philanthropists that Surrey does have its social issues even if generally wealthy. On Monday, I was in the SHIFT Room at County Hall being the rooms which are set aside for innovative discussions, and so have very white walls and grey plastic flooring to aid transformational thinking. The discussion was about developing SCC’s youth services, and interaction with the voluntary sector. I had a briefing session yesterday with my current Chairman, and prospective Chairman Designate – succession planning – who we hope will be voted in at our AGM next Tuesday evening. We also will be electing great new Trustees to the Board then, including Young Trustees, who I know will be brilliant. Great meeting in prospect with a social media entrepreneur who I am hoping will enable us to offer an improved “Getting started” 3 day workshop for young people wanting to set up in self-employment/sole trader or in a wider business/social enterprise. SO..not just philanthropic giving, important though that is, but also creating new businesses as a way to re-generation of communities. We need both “Giving AND creating” as a businessman observed yesterday evening. Check out new job vacancy in our team on our website. And that’s only about half the good news this week ..I even get paid for doing this fun work!! Yes INTERNAL…we had a visit from colleagues in SATRO wanting to find out why we chose a Cloud computing system – I write this from home at 8.15 am prior to going off to a meeting in Horsham with our sister organisation West Sussex Council for Voluntary Youth Services – and have all my email and files accessible to me. We are all totally independent of our office location. SO, realising that there may be a wider interest, we will be running a workshop about cloud computing. I have also been preparing for submitting to the Charities Evaluation Service for their Level 2 quality assurance scheme called Pqasso –“Practical quality assurance for small organisations” . We already have a Level 1 award, but it expires on 23 November after 3 years. So we are re-submitting at a higher level. I am very pleased that we don’t have to do too much work to bring ourselves up to Level2, unless I am wholly mistaken, which is pleasing as it means that our procedures and practices have become embedded. We are working on the press launch of CommUniLAB with our sponsors, and will tell you more next week. We have been invited by Surrey CC to consider taking over the management of Woking Youth Arts Centre in Knaphill, Woking, where the principal tenant is a member organisation of ours – Peer Productions – who do brilliant work in developing young people as actors in plays they devise themselves to illustrate social problems. These plays are then performed at the WYAC and taken in to schools. It would be a departure for us to undertake property management, and there are some very serious issues to consider. This will be a Trustee Board decision…but it is interesting strategically….there are 32 SCC youth centres. Finally, we are preparing for our AGM on Tuesday 17 September at 5.00pm at Walton Firs – a beautiful 25 acre camp site an (Ian Botham) stone’s throw from junction 10 on the M25. We have the Deputy CEO of the National Youth Agency (NYA) as main speaker. Should be of great interest to youth workers ..the professionalization of youth work…and to Members. Just email me if you’d like to come along. I get older this weekend and possibly wiser…I am thrilled to have treated myself to two brilliant theology books…I know….I know that’s what my wife thinks too ..but it takes all sorts! Up in London at the weekend to support daughter in law in charity half-marathon..running for a university friend who, as the result of an accident, is now blind and paraplegic …..very humbling.